Hello! 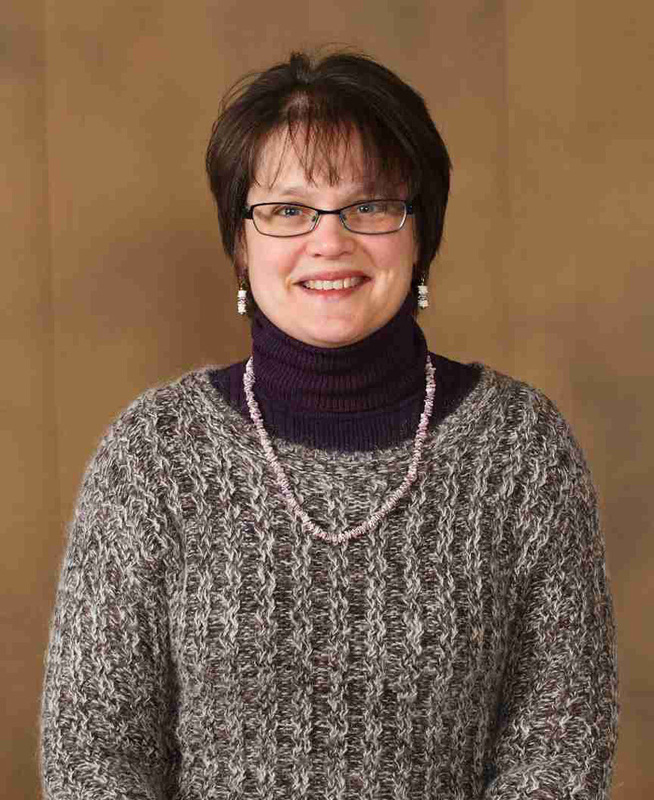 My name is Claire, and I am the new Librarian at St. Joseph’s Indian School. I am fortunate that I get to work with two of my favorite things every day—the kids at St. Joseph’s and books. We are in the process of updating the library to an automated catalog system, so I spent the summer barcoding, weeding and organizing the collection. I also got to open the boxes of book donations, which was just like Christmas. Connecting the kids with books was definitely the fun part. While battered copies of “Diary of a Wimpy Kid” and “Goosebumps” flew off the shelves, other interests took some sleuthing. Scary stories were a popular request—everything from ghost stories to movie monsters to tales of Bigfoot. 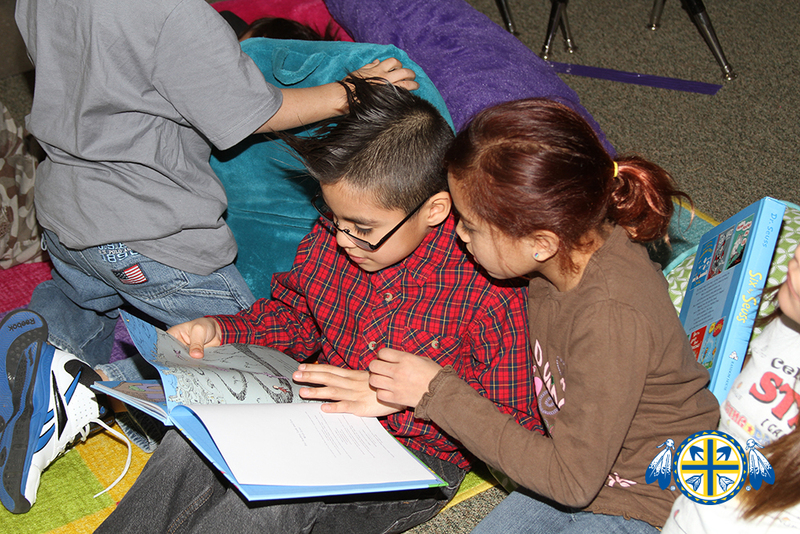 Two students enjoy reading a book together. Many kids asked for books about basketball—basketball teams, basketball players and stories about kids who play basketball. I loved it when kids asked for books about history and we got to talk about historical fiction versus non-fiction and the different time periods and populations. Animal books were another common request. I was very happy to show one young man a brand new encyclopedia of animals we had just received as a donation. It was an impressive volume with a bright picture of a Mandrill on the cover. His eyes lit up and he paged through the color pages with obvious delight. Another teen had been waiting all summer for the next book in the “Warrior” series. (A shout out to the generous donors who replaced several missing copies from this series—you are lifesavers!) And finally, I was able to help Mr. Library Reeks discover the “I Survived” series. He gleefully capered about, barely able to decide which two books to take now and which to save for next week. I grew up in a home filled with books. Unfortunately, many of the kids at St. Joseph’s don’t have a lot of books in their homes and don’t have access to a library over the summer. The school library is their best chance for getting good reading material. My hope is to share some favorite books with them and to guide them in finding favorites of their own. Having an automated system will make it even faster and easier to find just the right book. In the meantime, we’ll work on our library detective skills to discover what treasures lie in store. I am looking forward to it! I would like to thank our donors for providing good things to read for both our library and our bookmobile . You make such a big difference! Wopila tanka – many thanks! St. Joseph’s Indian School + GEMS = More Possibilities! 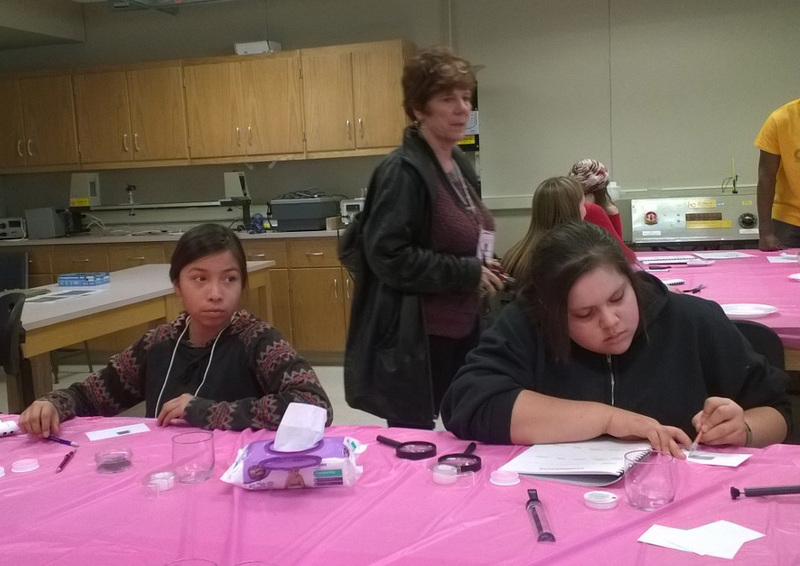 grade girls to the Girls in Engineering, Math and Science (GEMS) conference at South Dakota State University in Brookings, South Dakota. GEMS is designed to show girls career options in science, math and technology – fields where girls are underrepresented. At GEMS, they meet a lot of young women who love math and science and who excel at it. Having female role models helps break the stereotype that certain subjects or careers are off limits. Engineering and math are all about solving problems, so our fearless girls got to try their hand at solving some interesting problems at GEMS. One problem was how to build a bridge that would hold up the maximum amount of weight while using the minimum amount of weight in materials. Several students of civil engineering were on hand to help with blueprints and construction supplies. 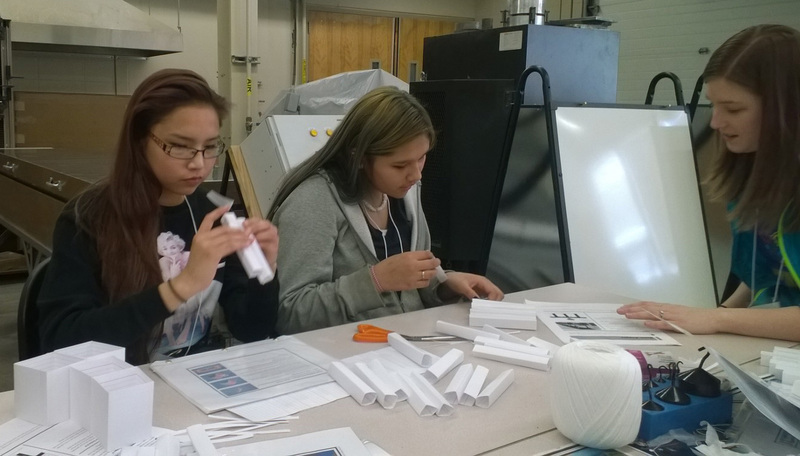 The girls used folded paper, tape and brads to build a girder and beam-type structure that even survived the trip home. Treyah and Lara doing fingerprinting while Kathleen looks on. Next, they got to try their hand at forensic science. They had to determine which of two suspects broke into the lab and stole some copper tubing. They took hair samples, dental impressions, fingerprints and footprints. They ran a chemical analysis of some powder that was left at the scene. A scientist from the state crime lab was there to show them how to do hair analysis. Pretty soon they had their culprit. Sarah and Aalyiah building a bridge while a GEMS volunteer helps out. parts and had to make a working robot. We had a battery, two motors, two wheels, a controller and a bunch of wires. With some encouragement, we found that we could follow directions and use the tools we were given. With patience and perseverance we managed to hook everything together. It was very satisfying to drive our little robot around in circles on the floor. Yipppeee! GEMS was a good opportunity for our eighth graders to see what kinds of career choices were available to them. It was also a good opportunity to start talking about high school curriculum choices. The kinds of classes that they choose to take in high school can affect the college paths open to them. Most of our girls aren’t thinking quite that far into the future. St. Joseph’s Indian School is a place of possibilities, where we try to expose our students to many options for their futures. Thanks to the staff and volunteers at GEMS for giving our girls such a great learning opportunity and for acting as positive role models. Girls Rock! Thank you also to all our generous benefactors who make trips like these possible. We couldn’t have learning experiences like this without you. Author St. Joseph's Indian SchoolPosted on April 2, 2015 Categories Claire, Guest BloggersTags South Dakota, St. Joseph's, St. Joseph's Indian School2 Comments on St. Joseph’s Indian School + GEMS = More Possibilities! The sound permeates the classroom, alerting a tiny Bat Signal in my brain. I can hear that this Groan is serious though. I scan the room, and see that it is Joe who is struggling. He’s got his head on his desk and he’s pulled the strings on his hoodie so tight that all I can see is the tip of his nose peeking out. I squat down by Joe’s desk to see what is going on. From the start, it doesn’t sound good. I know that he is already behind in his Math. He came to St. Joseph’s Indian School this Fall slightly behind his peers, and has been struggling with his basic arithmetic skills this entire quarter. This week he spent several days in the Health Center, too sick to even do homework. And now he is trying to catch up with the class. Not only does he not feel like doing it, he doesn’t think he can do it. He is falling into hopelessness. “There’s no point! Even if I do it, I won’t get to goooooo.” By “get to go” he means he won’t earn the extra hour of free time at the Rec Center on Friday. All students who don’t have D’s or F’s can earn this privilege, but Joe has a D.
This isn’t going to be a quick fix. Joe will need to be coaxed out of his hoodie. Then he will have to be coaxed out of his anxiety and frustration about a subject that is difficult for him. His regular teacher, Sandi, is much better at this than I am. Still, it is a worth a try. Yes, you can. We will do it together. Stay with me. We can do this. This goes on for about 10 minutes—him flopping, and me putting the paper back in front of him and urging him on. And then the miracle happens. He figures out a part of the problem on his own. Something clicks. “Oh, hey, I know what this is.” Pencil goes to paper. His shoulders straighten a bit. “I think I get it.” More scribbling. “Is this it?” I breathe a grateful sigh. Yes, yes it is. By the end of the hour he has finished the day’s assignment. His face is brighter and more relaxed. I don’t know if this will bring his grade above a D. I know it barely makes a dent in his pile of missing work, but for the moment, he is basking in his newfound success. Fist bump! At the end of the day it is the little successes that end up making all the difference. I haven’t saved the world. I haven’t even taught him how to change fractions to percents. I’ve just sat with a student while he muddled his way through it on his own and kept him from giving up. Sometimes a little support and encouragement is all we need. Thanks to all who made Joe’s success possible—from his teachers and houseparents who give him lots of structure and encouragement, to his family who entrusted him to our care. Joe also benefits from the small class sizes and individual, coordinated attention he can get at a residential school like St. Joseph’s Indian School. For this, we have to thank the many benefactors whose generosity makes it possible to help a great kid like Joe. Wopila Tanka – many thanks! students arrived back today for the break home, though. High school students on the basketball teams are expected to practice over the break. Unlike their teammates who live in town, St. Joseph’s Indian School students must leave their families back home in order to be able to make practices. This shows an extra level of commitment and sacrifice. The break home provides some structure and support for our winter athletes. That doesn’t mean that things aren’t festive. The mood over break tends to be pretty relaxed—no school during the day and no homework to be done at night. The high school kids who don’t have early morning practices love to sleep in. Evenings are spent socializing or watching movies. A few years back, I was working in the break home with Craig and we decided to make the 70-mile trek to the closest “big city” of Mitchell, South Dakota, for a trip to the movies. We loaded up the Suburban with seven kids and off we went. All was going so well—the kids enjoyed the movie and an impromptu trip to Wal-Mart. We were heading home when the engine started making strange noises. And then the transmission blew. There we were, stuck in first gear and unable to go any faster than 3 miles per hour. It was 9:00 at night, we were an hour from Chamberlain and it was a dangerous 17 degrees below zero. Thankfully, we were right at an exit. A passing Sheriff saw our flashing lights and accompanied us up to the ramp. But even he got impatient and after about 15 minutes of us chugging along, he turned tail and left. Luckily the kids thought this was great fun. They cheered us on, “Go Craig Go! !” and even leaned forward to help us go faster. We headed toward the closest gas station, picking up a little downhill speed until we were careening along at 4mph. One of the kids had to go to the bathroom. He got out, ran to ahead to the station, used the loo, and still beat us to the parking lot. The kids weren’t particularly stressed or upset. Maybe it was because the heat and the stereo were working. So we were cozy and had our tunes blasting. Maybe it was because they could see the humor in the situation—Craig talking to the engine, urging her on like a racehorse. But I think mostly because St. Joseph’s is a safe place. One of the awesome things about working at St. Joseph’s Indian School, is that when disaster strikes, there is always someone to call. We were armed with cell phones and help was immediately on the way. Our on-call supervisor and her husband drove 50 miles from Chamberlain with another Suburban and met us at the gas station. We had just arrived, making the 3 mile drive in just under an hour. In many ways, St. Joseph’s Indian School provides a safety net for our kids. Sometimes it’s a dramatic sub-zero temperature rescue, but mostly it’s the small stuff—a safe place to spend break, a sympathetic ear when the coach is tough and muscles are sore, a few encouraging words before morning practice. That safety net can mean a lot, especially when the going gets tough. If you are reading this, then you are part of our safety net too—pulling for our kids, offering encouragement and keeping them in your prayers. Thank you for all you do to make our kids feel safe and supported. students were paired up with an adult—either a relative or a staff person—to accompany them throughout their time in camp. It was a time for using storytelling, ceremony and art to process feelings of loss. We took a holistic approach, addressing the spiritual, physical and emotional aspects of grieving. Family members were an important part of camp, and on-campus housing was provided for relatives who were coming from long distances to participate. Several themes emerged as the camp progressed. One theme was that of heartstrings—the invisible and yet unbreakable connections between us and the people we love. 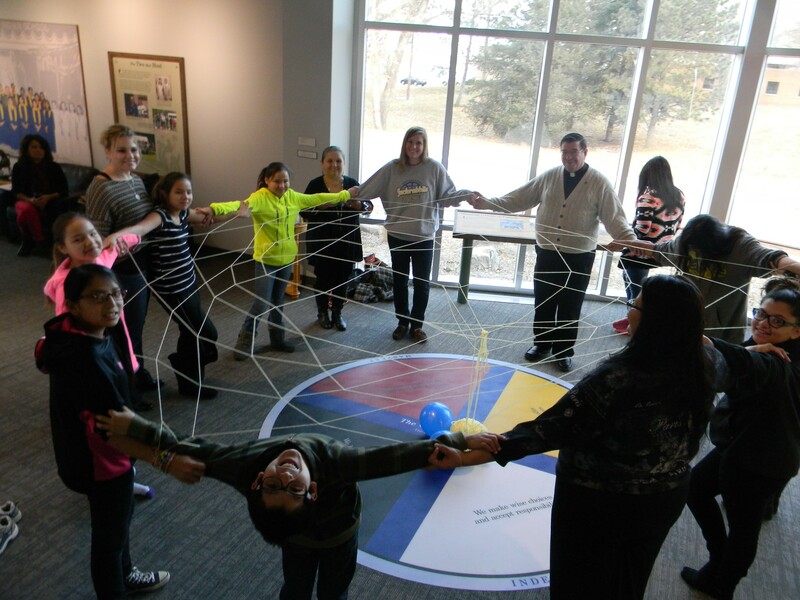 As a group we made the world’s first known human dreamcatcher. We stood in a circle as Clare read the story of how the spirit Iktomi brought the dreamcatcher to the people. All the while, LaRayne wove a web among the members of the group connecting each person to everyone else because – Mitakuye Oyasin —we are all related. Later, we strung all our prayers for our loved ones together by making prayer ties out of red cloth and sage. These were tied together and hung outside in the branches of a pine tree. The first known human dreamcatcher! Stories like these were important because they reminded us of who we are, where we came from and where we are going. Another traditional story about the origins of the Milky Way reminded us that we are not alone, and that those we love are always with us. Our Christian stories reminded us that death is not the end, and that we are going to be reunited with our loved ones in God’s embrace. One underlying theme was the task of accepting things as they are. Nobody cries the same way, and there is no wrong way to grieve. Each person felt their loss in his or her own way and had a unique way of expressing that—laughter, tears, drawing, avoidance, writing, numbing out. As a group, we had to adjust to what worked or didn’t work for each person, and to treat each person’s process with respect. Sometimes that meant letting go of expectations about what an activity would look like, or how a group interaction would take shape. We ended the day with the Wiping of the Tears, a Lakota ceremony for the end of the mourning period. A Dakota elder said a prayer and sang a song, while helpers offered each participant sage water and a ceremonial combing of the hair and wiping of tears. The ceremony provided a sense of closure to our camp, while reinforcing the sense of support and connection in the group. I want to thank the people who made this camp possible—the family members and staff who gave of their time and of themselves to our students, the dying mother who requested this for her children back when camp started in 2003, the Akta Lakota Museum & Cultural Center staff who were very gracious with the use of their space, and the many benefactors who support the work at St. Joseph’s Indian School. Wopila tanka, many thanks. Chateauxroux, France. 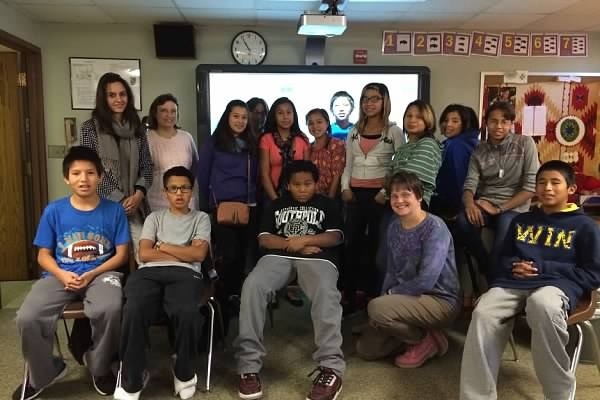 Cultural exchanges like this are exciting, since it gives our Lakota (Sioux) students a chance to see a world that is different from their own. Since I speak a little French, I accompanied our visitors on several occasions. Though they needed very little help with translation, some of our customs seemed unusual to them. In Native American Studies class, Blandine shared a book about the Berry region of France, and the students listened with interest. They had questions about holidays like Halloween and Thanksgiving –which the French don’t celebrate. (No trick or treats? No pumpkin pie? Say what?) Our students wanted to know how long French school days were, and what French people liked to eat, and whether there were buffalo in France. In Art class they got to try the French craft of scoubidou (braiding plastic thread into lanyards). St. Joseph’s visitors from France enjoyed time with the sixth graders. In turn, it was fun to show off some of the finer examples of Lakota culture that are incorporated into our curriculum—the reading of the Our Father in Lakota every morning, and the singing of the Lakota Flag Song. Our French visitors got to see some regalia and watch some dancing. I was proud of our students when they demonstrated traditional greetings and phrases in Lakota. Then our visitors wanted to see the Indian Reservations where many of our students live. This was a bit uncomfortable at times. On one hand, it was important for them to see where the kids come from and why they need to be at St. Joseph’s Indian School. On the other hand, I felt protective and a little bit defensive. Driving past some of the burned-out houses was awkward. When I looked through the eyes of our visitors, I saw homes in disrepair, gang graffiti, trash and scary Halloween decorations (which didn’t really help matters any). Many students resent a blighted picture being painted of their homes, and I can understand this. I wanted to explain that this may be where people live but is certainly not all of who they are. I wanted to bridge the gap between the beautiful cultural lessons of the classroom and the ugly landscape of the Rez, but I couldn’t. There was too much history here, and too much despair. My pitiful French wasn’t up to the task of expressing it. I was grateful for the compassion on the eyes of our guests. Some parts of the reservations are quite beautiful, with sweeping views of the hills and river valley. We visited Big Bend, a place where the river makes a tight loop, leaving a spit of land only a few miles across. There we toured an earth lodge – a reproduction of a typical Mandan home – like those that would have been found on this site a few centuries ago. Then we hiked up the hills to a high point where we could see for miles around. Maybe the best part of having visitors was the gift of being able to stop and see the work of St. Joseph’s with fresh eyes. I saw the contrast between the plight on the reservations and the calming structure of our homes and school. I saw the strong, positive connections between staff and students. Since our visitors were also benefactors, I was also keenly aware of what sacrifices they made in order to be able to provide these good things to our students. At their school in France, students gave up one meal during Lent and ate only rice. The money they saved they sent to St. Joseph’s Indian School as a gift. I want to thank them, and all our benefactors, for making our school possible. Life is like a corn maze, isn’t it? 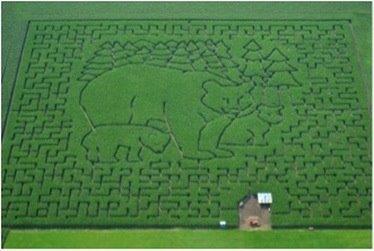 been to one, a corn maze is a series of paths cut into a corn field. Once inside, you must follow the twists and turns to find a series of 10 clues, using a map, and the setting sun for a compass. Small groups of mentors and their matches travelled through the maze together. The Lakota students, full of youthful exuberance, quickly bounded into the corn field shouting, “I found the path!” As if there was just one path and not, oh, 7 or 8 of them. It really didn’t matter which one, since everything was brand new and exciting to them. Off they went, with us slow adults in tow, struggling to keep up. About three turns in, we were hopelessly lost. Well, not hopelessly. After about 10 minutes of random running around, we actually bumped into the third clue completely by accident. This is when the map came in handy. This is how relationships at St. Joseph’s work a lot of the time, really. Kids are exuberant and full of energy, but aren’t always able to discern the right path. Adults can guide them most of the way, advising them where to turn and where to stop along the way. In the end, the kids have to make it to the goal themselves. There are plenty of opportunities to reach dead ends, back track and start over again. We can take shortcuts, but mostly we have to go the long way around and just be patient. Sometimes we’re not lost, we just don’t know exactly where we are. The important thing is to stick together, listen, and look out for each other. Also, be open to the tiny miracles along the way. Like a red moon rising over the horizon. Or someone unexpectedly offering you their gloves for your frozen hands. My group found all ten marked clues, and headed triumphantly for the exit, brandishing our flashlights in victory. Eventually, all kids and adults were accounted for, giving a new twist to the No Child Left Behind law. We trundled onto the bus for the two-hour drive back to Chamberlain and St. Joseph’s Indian School, happy and tired. I’d like to say thank you, not only to the people on the Mentor Committee who worked so hard to make this happen (Celia, Dee, Sherry and Jim), but also to the generous benefactors who support us in our work. Like flashlights in a maze, every little bit helps us to get where we are going! Author St. Joseph's Indian SchoolPosted on October 17, 2014 Categories Claire, Guest BloggersTags Chamberlain, Lakota, South Dakota, St. Joseph's, St. Joseph's Indian School4 Comments on Life is like a corn maze, isn’t it? they have been looking longingly at their new playground, which is still a few weeks from completion. They have been checking the blueprints posted outside the school office, marveling at the towers, tunnels and slides. They can hardly wait! In the meantime, they have playtime in another area — walking, talking, and playing basketball. Most of the physical work on campus happens during the summer time, so it is behind the scenes. The students arrive to see clean homes, new sidewalks and beautiful lawns. Seeing a crew of people doing construction on the playground is a bit of a novelty. The new playground for the Lakota boys and girls is making progress, but not done yet. It has also proven to be an opportunity for generosity. At St. Joseph’s, we practice the Circle of Courage values of Belonging, Mastery, Independence and Generosity. These first few weeks of school we focus hard on Belonging—making sure each student feels connected in their home and classrooms, assuaging the inevitable bouts of homesickness, and building a sense of community. Some of our eighth grade students jumped at the chance to practice other values as well. They used some of the cooking skills they learned in Personal Living Skills class to make treats for the playground construction crew – demonstrating Mastery. St. Joseph’s students brought cold lemonade and a snack to the crew on a hot day to demonstrate generosity. show of Independence and Generosity. The students introduced themselves and got to know the names of the crew, who hail from Omaha, Nebraska. It was a hot afternoon, and the crew was very grateful for a snack and some cold lemonade. 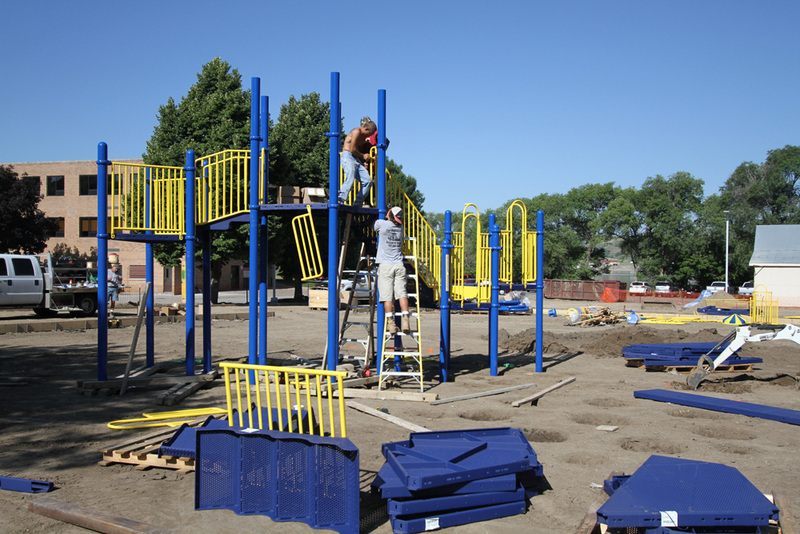 The students were grateful and excited to see the progress being made on the playground. They heard about what it was going to look like when it was finished, and got personal assurances that they were going to have a well-built, top-of-the-line play area. It was such a good experience for the students that they are planning on visiting again in the upcoming weeks. As for staff, we were proud of our students, grateful for the hard work of the construction crew, and especially grateful for donors who made this new playground possible. Thank you to everyone —from our grounds crew, to the construction crew, to all benefactors who contributed. Pilamaya! 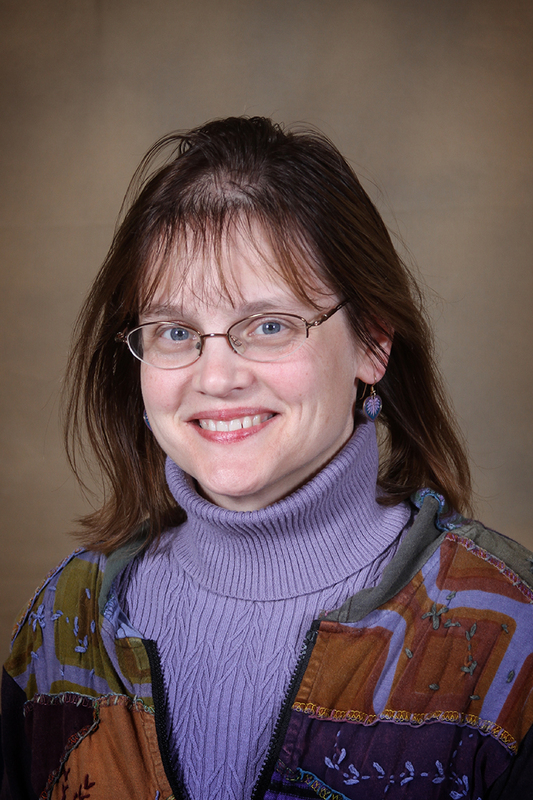 Pilamaya – thank you – for working on our playground! special about having something solid in my hand. I’m not picky. The other day, I was helping out in St. Joseph’s first grade classroom and one of the students drew me a picture. It was of a tornado. I wasn’t exactly sure why. I thought it was because we had a tornado drill the previous afternoon. I have that one up on my fridge. And now is the time of year for those notes that I both love and dread so much: graduation announcements. (When did they get to be so grown up anyway?) I love seeing graduation pictures for eighth graders and seniors alike. I love hearing about their plans, and talking about their dreams. I admit to getting a little soggy when I think about them moving on from St. Joseph’s Indian School. What kind of letters and notes do you like to get? I hope you enjoy the slice of life you get from St. Joseph’s mailings. I love sharing these stories with you, so that you know what kind of impact you have on our lives here – all our lives, both the kids and those who are privileged to work with them. Wopila tanka – many thanks!